Bits or pieces? : More of, Less of and Nation States. 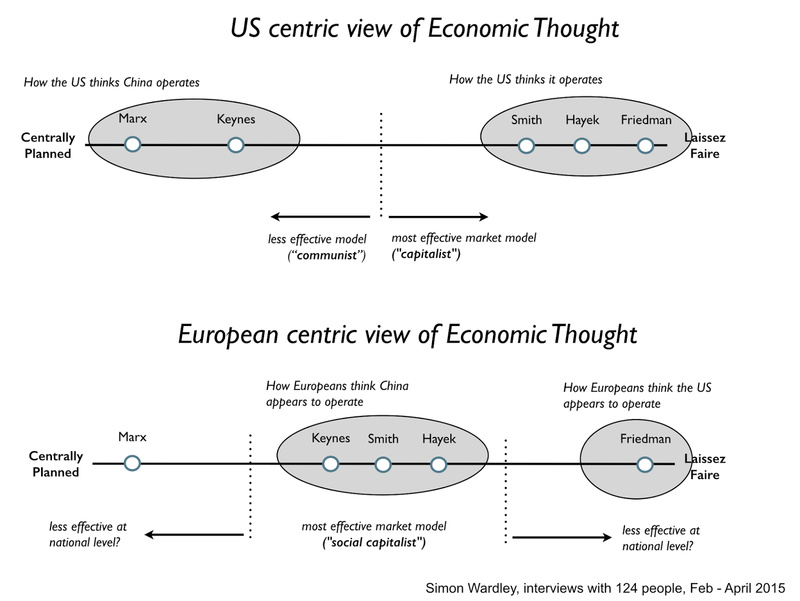 Many years ago, I talked about how organisations evolve caused by a particular cycle known as peace, war and wonder (an economic counterpart to Holling's adaptive renewal cycle). This cycle is caused by an interplay of evolution from competition, co-evolution of practice, inertia caused by past success and network effects creating a punctuated equilibrium. 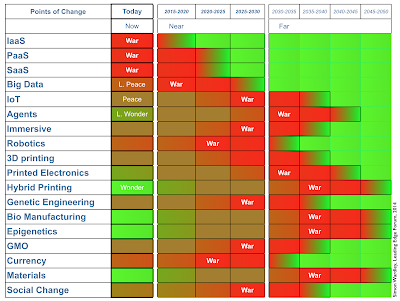 The most interesting part of the cycle is the "War" part (as in "War with the past"). What happens is underlying activities shift from product to utility initiating the rapid spread of emerging and co-evolved practices which in turn cause new organisational forms. 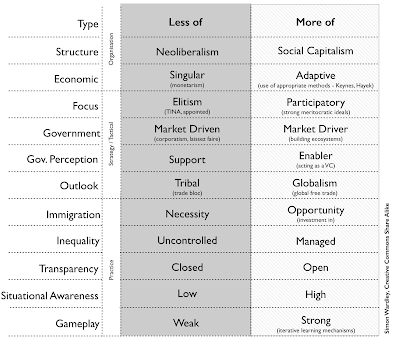 Back in 2011, the change in underlying activities (e.g. 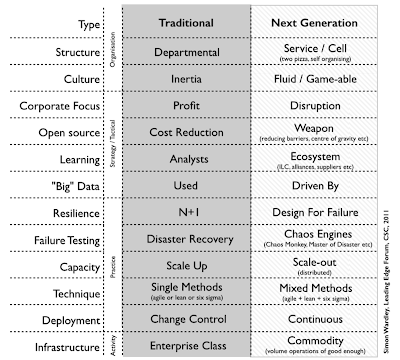 compute shifting from product to utility) was leading to a change of practice and a new organisational form, described in the diagram below. Firms were either becoming "less of" traditional and "more of" next generation or potentially putting their future at risk. I'm pinching the less of, more of moniker directly from GCHQ's most wonderful document boiling frogs. Figure 1 - Changing organisational form. The point of "War" (i.e. industrialisation from product to commodity) is broadly predictable in terms of when and what (general effects) but not whom. This is because the change itself is driven by competition of all market actors whereas the company that initiates it depends upon an individual actor. In other words we can say roughly when something is likely to evolve to a more industrialised form, we can say what general effects will occur (co-evolution of practice, inertia of those stuck in previous models of products) but not specific effects i.e. what the co-evolved practice will look like or which company will lead the charge. For example, we knew that something like Devops would emerge but not what the detailed practices were (until they emerged) nor which individuals would drive it. However, even those small areas of broad predictability can create an advantage because we can prepare for change. Hence back in 2005 at Fotango we knew that compute would become a utility and could prepare for it. Ditto with Canonical in 2008, we knew many of the changes that would occur and could keep an eye out for it and exploit it. These points of industrialisation (known as "war" as in "war with the past") are calculated from changes in publications and in early 2014 this data provided figure 2. Now, one aspect I get asked about is "Social Change". Well, I'm expecting significant changes in society broadly 2025-2030. I re-ran the weak signals used in the above in late 2014 and still expect the same. But whilst I'm expecting change, what that change will be (i.e. what practices will emerge), I don't know. I do expect some nations to resist it (due to inertia caused by past success) but I don't know what they'll resist and which nations will drive it i.e. who will gain the advantage and who will have to adapt just to keep up. Remember, the weak signals in figure 2 are purely driven by changes in publication - so it gives me some information of a point of change approaching but no more than that. I put this "social marker" in more for myself, as a reminder to examine changing nation states at that time. 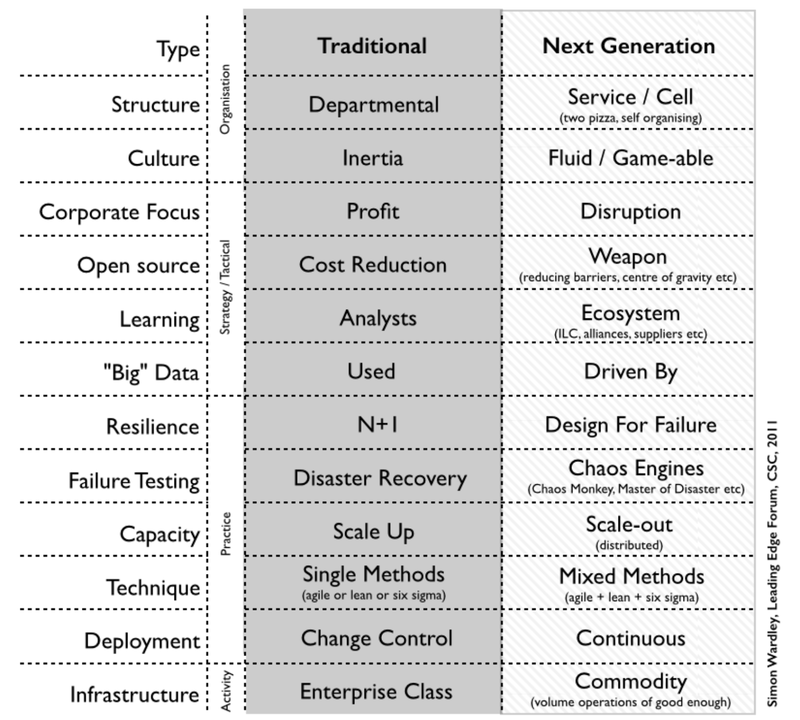 In much the same way I had anticipated long ago that organisations would change due to the evolution of underlying components from product to utility and waited until late 2010 and early to mid 2011 to test it. I hope the same population techniques I used to create the phenotypic differences of figure 1 should be applicable to nation states. I have no ideal whether the techniques will work, I'll just have to wait and see. But this is an ongoing test for me as to the validity of the cycle. Whilst I might not know what those characteristics are or who will drive it, I can guess based upon existing shifts in geopolitical power. I suspect the country that will represent the future nation state is China (hence my interest in researching into China during end of 2014 and 2015). If I was going to make a stab in the dark towards what those characteristics will be, then I'd probably bet here based upon factors which appear to help drive greater competition. 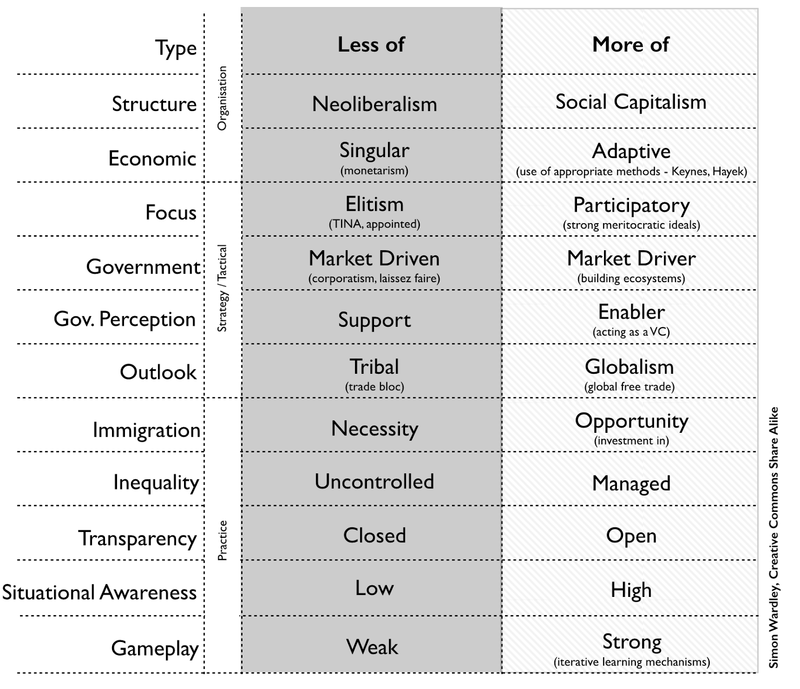 Some of the characteristics that I'll pick have already emerged in China but others are somewhat lacking but exist elsewhere (see figure 3). Figure 3 - Best guess for changes in nation states. Obviously this is a guess, not based upon data and as such is hugely subject to my own personal biases and wishful thinking. The result (if it occurs) maybe nothing like this. However, this again is more a marker for myself i.e. what I hope advanced nations will become more of which I then can compare to what actually happens (if at all). Was asked one of those "China is a communist country, not neoliberal" questions. Actually, that's a really interesting topic and China (from my perspective) is firmly in the social capitalism camp and acting as a venture capitalist. However, the problem here is one of perception, see figure 4. 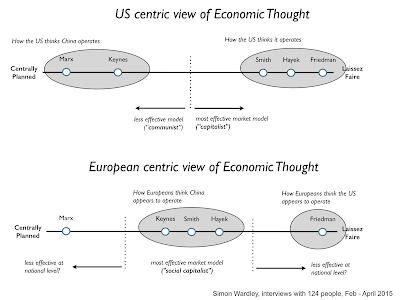 So, on average it seems when you're talking to someone in the US they often have a difficulty in agreeing with Europeans over what China is (and vice versa) because even within Western philosophy we have different ideas of where economic thought is placed.